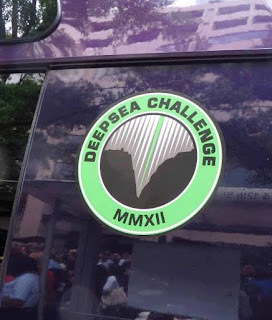 Deep-Sea Citizen Science??? Okeanos Begins August 1 in the Hawaiian Islands! 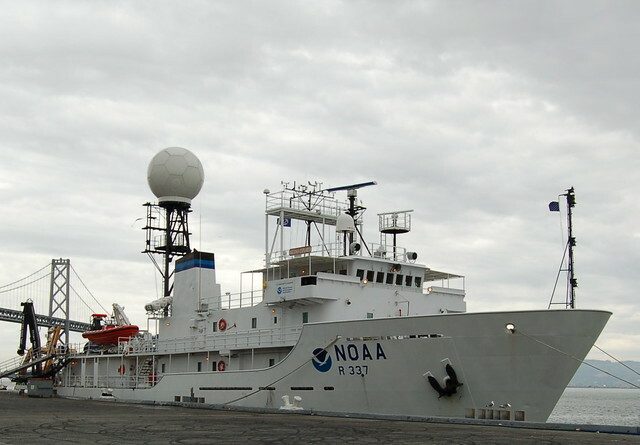 So, on August 1, the NOAA research vessel Okeanos Explorer begins its first livestream ROV dive as part of the 2015 Hohanu Moana Expedition to investigate the deep-sea habitats of the Hawaiian Islands region. Why am I so Farkin' excited about this?? 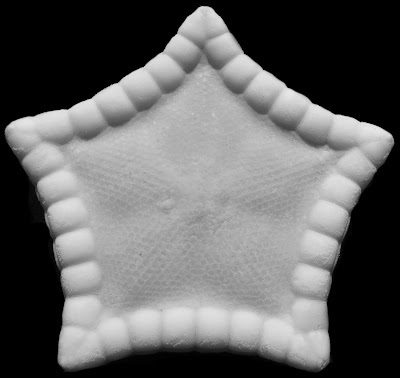 I've been studying deep-sea Hawaiian starfish since the mid 1990s and in fact, my very first EVER publication was a checklist of Hawaiian starfish based on material at the Bishop Museum in Honolulu. In 2001 I got to actually go to the BOTTOM of the Hawaiian deeps! (about 1000 m I think?) in the submersible Pisces V.
So, to actually be able to SEE all of these species with High-Definition video?? EXCITING!! 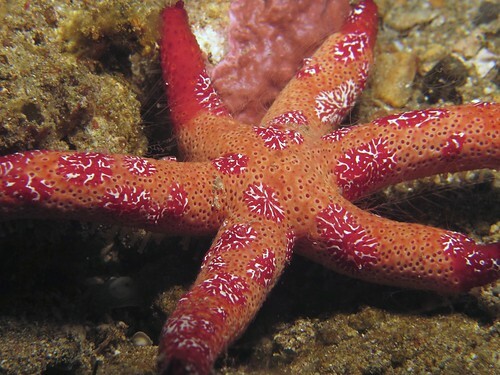 What Sorts of Starfish and other Echinoderms Will We See?? 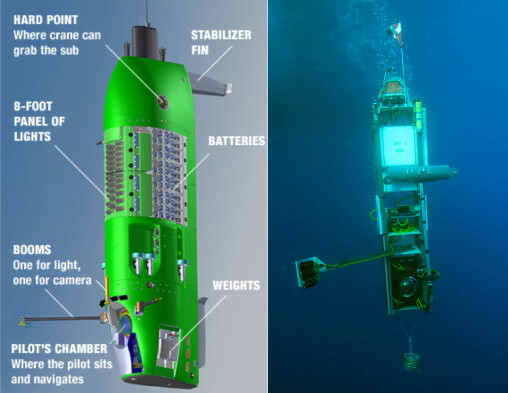 As with past Okeanos Explorer dives, the dives will involve a Remotely Operated Vehicle deployed to the deep-sea with narration but also with ONSHORE support via phone, computer and social media. That includes me and a veritable ARMY of other marine biologists, including ecologists, taxonomists (i.e. people who identify different species) and geologists. 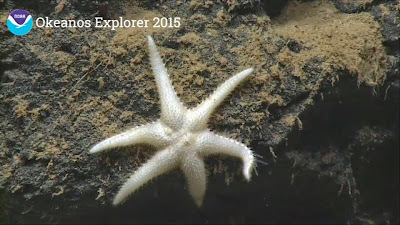 I've helped summarize the various starfish species seen on Okeanos Explorer dives in the North Atlantic (here). But the diversity in the Hawaiian region and especially in the Pacific is fair bit MORE diverse! 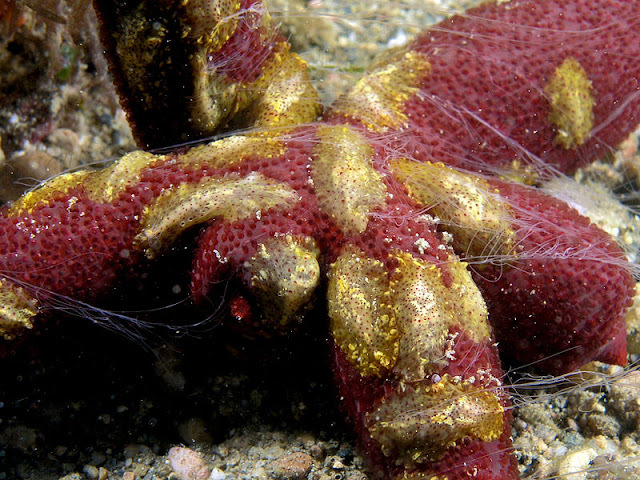 and even though there's been a deep-sea research operation in Hawaii for the last 30 years or so, the truth is, we don't know a lot about many of the animals which live out here. So, the chances of our seeing something new out here? I would think those chances are VERY good! 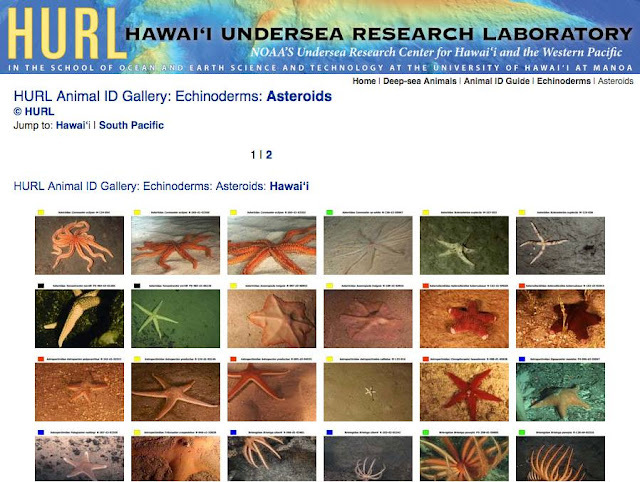 The folks at the Hawaiian Undersea Research Laboratory have an "ID Gallery" not just of Sea stars but of ALL the many different animals found at depth here... from crustaceans to corals and sea urchins to fish! 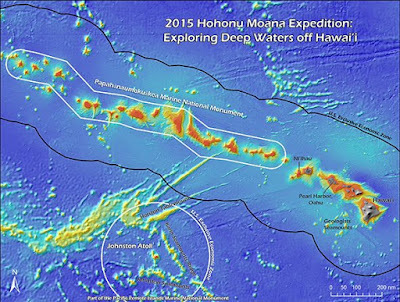 There's the potential to encounter one of approximately 55 species of deep-sea asteroids described in the Hawaiian region (that's not including any shallow water species). 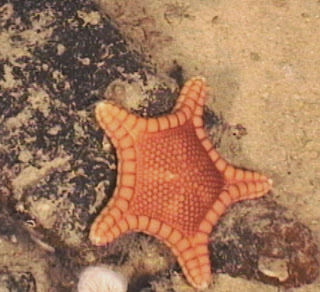 I've had the pleasure of describing at least four NEW species in the Hawaiian region, including Apollonaster kelleyi, named for Dr. Chris Kelley who will be one of the science leads on the Okeanos team! 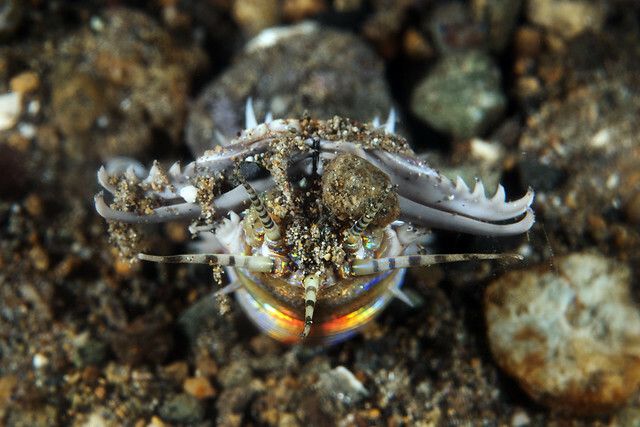 We may even get to see my other new species, Astroceramus eldredgei (named for Lu Eldredge at the Bishop Museum) in glorious feeding action! 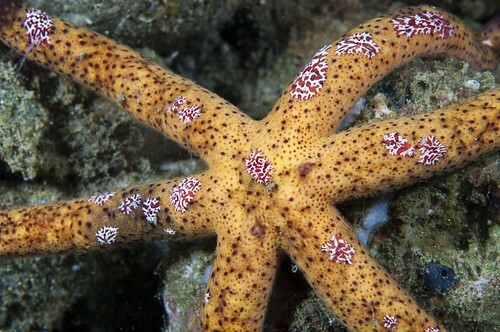 Some of my work with brisingid sea stars (here). BUT WAIT! That's not all! What about the Citizen Science part I mentioned!!! 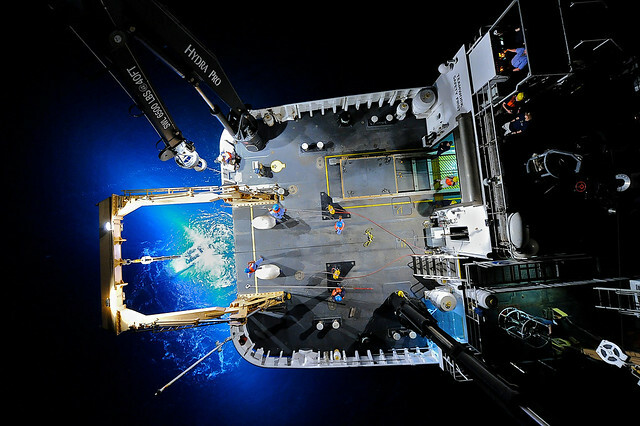 The Okeanos live stream has played a big role in part of a new and fascinating dynamic to deep-sea research! Citizen Science! Now ANYONE around the world can watch a live streamed research cruise! (Note: Google is GREAT at helping calculate the time differences in different parts of the world). But how does the citizen science thing work? Screengrab software is pretty much a free feature on computers. My macintosh has it and I'm pretty sure most PCs have it. And if it doesn't already come with it, you can probably download some free software for it. There are even software apps that allow you to take short movies off the video feed. So, basically, ANYONE can basically take a screengrab off the feed and contribute to a larger community of scientists and other interested people who are interested in deep-sea biology!! IF YOU SEE SOMETHING NEW you will see it along WITH the scientists and the entire world! Who knows? Maybe a screengrab that YOU take could lead to a new discovery!! Where do you find these and how do you contribute? There's TWITTER of course! Hashtag it with #Okeanos and Boom! there it goes! If I can, I actually make it a point to LIVE TWEET any identifications and observations I make off the live stream.. The other interesting option is the FACEBOOK Underwater webcams Screenshot Group! 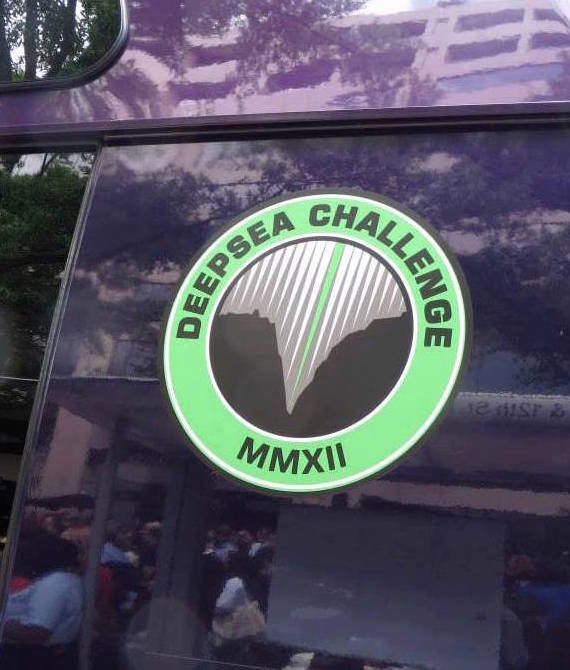 So, basically if you join, this group is made up of nearly 1000 people (some scientists but many are not) that are just taking and posting screengrabs from underwater live stream video including R/V Nautilus and Okeanos Explorer. There's usually someone on taking a grab of something almost 24 hours a day. If you missed that cute dumbo octopus?? Not to worry, in all liklihood, someone took a screen grab of it on this group! If you see something during the Okeanos feed, you can usually ask someone on Twitter or in the Facebook group and one can usually get a response the same day.. There are innumerable taxonomists and scientists monitoring. Some will call in on the phone, which you'll be able to hear on the live stream, others may add information via the Facebook group while others such as myself may Tweet an answer. Who knows what we shall discover in Hawaii??? 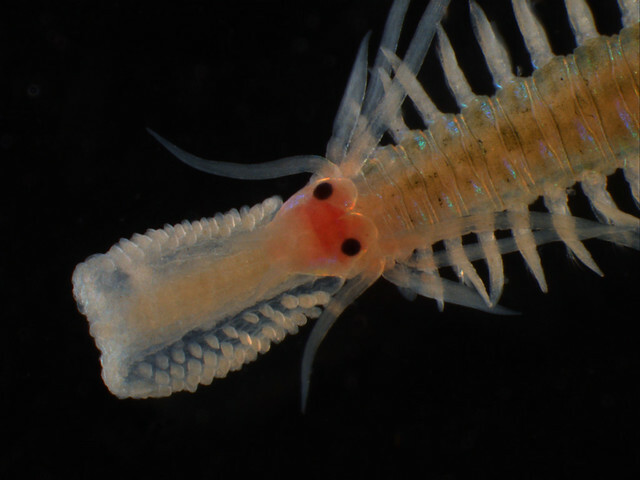 Following International Polychaete Day (July 1, here), I found there was quite a bit of neat stuff worth sharing, which led to more and some more.. and so a second polychaete post in July! woo! 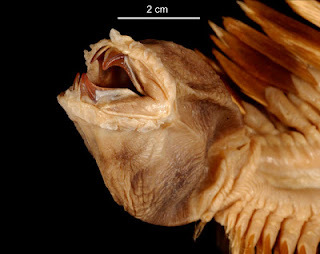 So, many of the polychaete worms have some pretty impressive jaws! 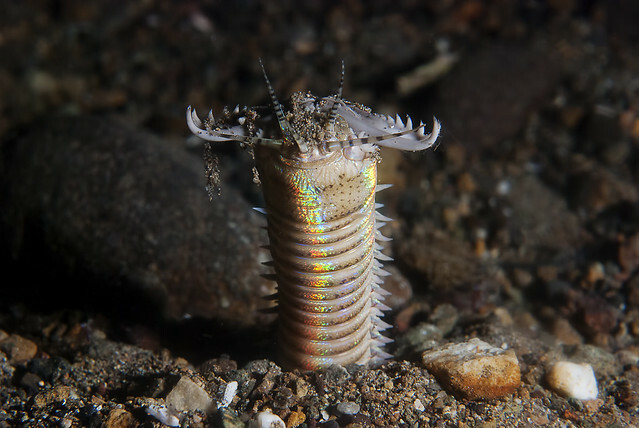 Many are raptorial predators such as everyone's favorite eunicid-the Bobbit worm But many are just as easily omnivores or scavengers. Honestly, I'm not sure which species are known for specific habits. As we'll see even having an eversible pharynx does not seem to be immediately associated with predation. Although the "fast strike"/raptorial approach seems likely.. Here is an SEM of another scale worm, but from a hydrothermal vent habitat..
Not sure which kind of polychaete this is from, but I'm going to guess that its from something similar to the above scale worms.. Here's a pretty incredible video showing the green worm with an INCREDIBLY extended proboscis trying to devour the red polychaete next to it.. Yow. 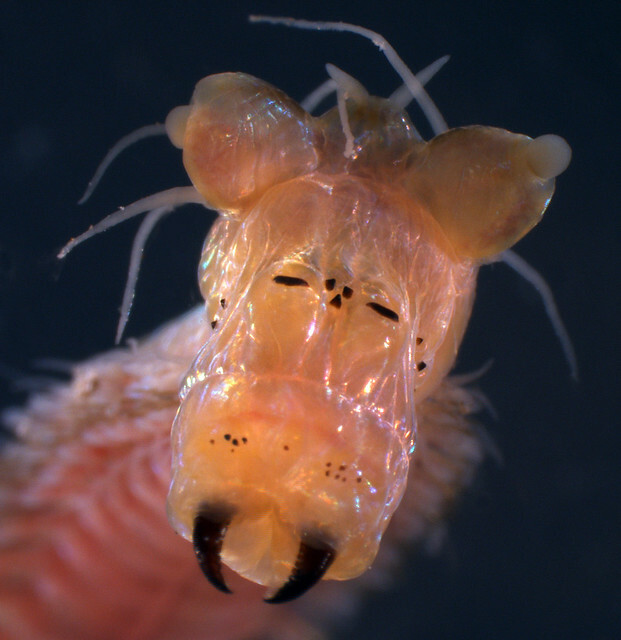 These two both identify the subjects as Glycera, which I'm not 100% sure of, but it does look like they both show off that impressive polychaete proboscis! 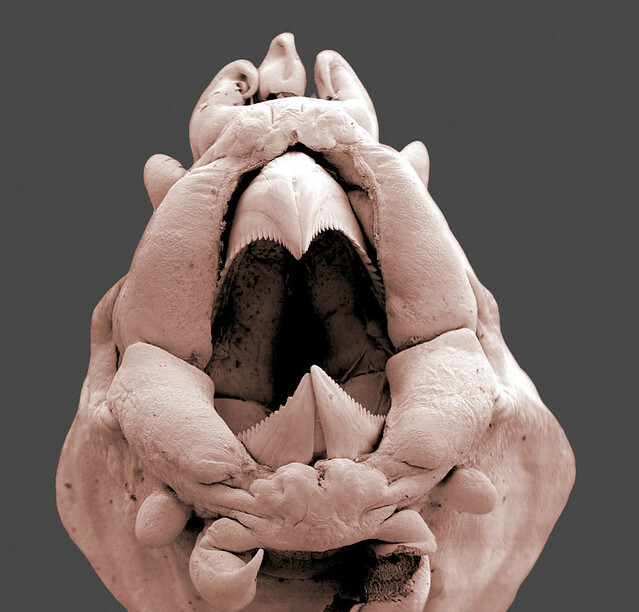 Here is a nice phyllodocid worm with its proboscis extended..
And here's a very formidible looking one from Nephtys sp. 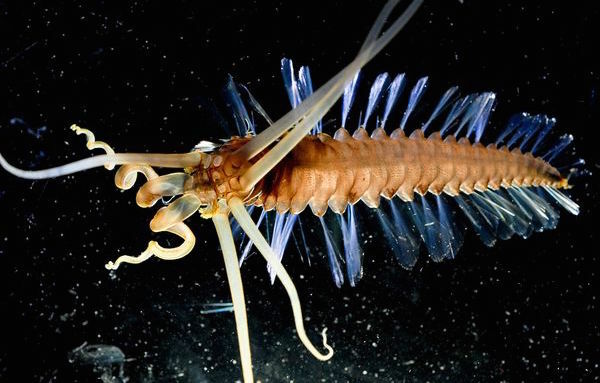 Another extended proboscis in a nereid worm from French Polynesia..
and of course.. the Bobbit worm, Eunice sp. with its big spring loaded jaws!! 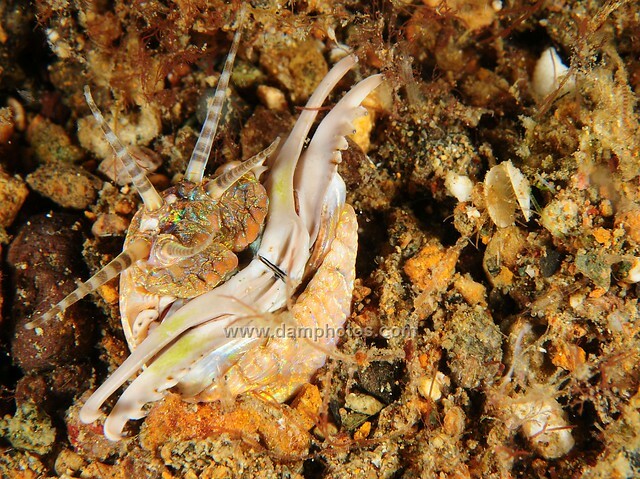 Some of these Bobbit Worm macro shots are so tight, its practically like one staring you in the face! and to cover the full gamut, this video shows the proboscis in what looks to be some scavenging. I do not vouch for the identifications.. 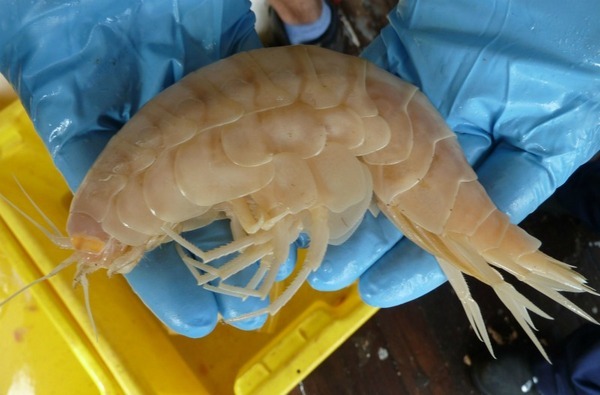 Biology we have learned from James Cameron's DeepSea Challenger Expedition! This week a new paper that I think everyone will be interested in! 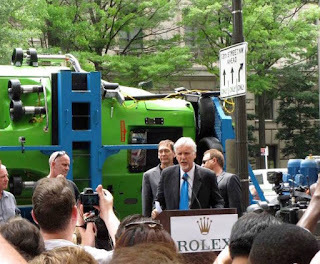 Remember back in 2012 when filmmaker James Cameron (famous for Terminator 2, Titanic, and Avatar) personally travelled down to the deepest known place on earth (> 10,000 meters!)? It was in all the papers! There was certainly some good criticism of what was accomplished but many argued that even though Cameron himself did not bring back very much, he did apparently make some collections which were studied by scientists at Scripps Institute of Oceanography in San Diego, California, and as explained by Deep Sea News' Holly Bik even mud from that depth holds the potential for interesting data (here). So, here we are now THREE years later and one of the first papers detailing results from Cameron's Expedition has been published!! ! The OPEN ACCESS paper was published just recently in Deep Sea Research in the May 2015 issue, written by Natalya Gallo at Scripps Institution of Oceanography and a host of coauthors, including yes, director James Cameron. 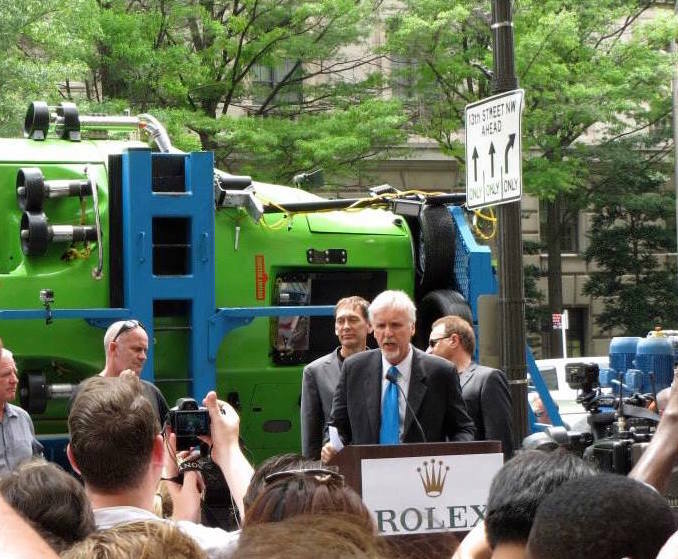 Cameron famously descended in the one-man submersible, DeepSea Challenger to 10,000 meters where he took some video and grabbed some mud.. This paper by Gallo et al. 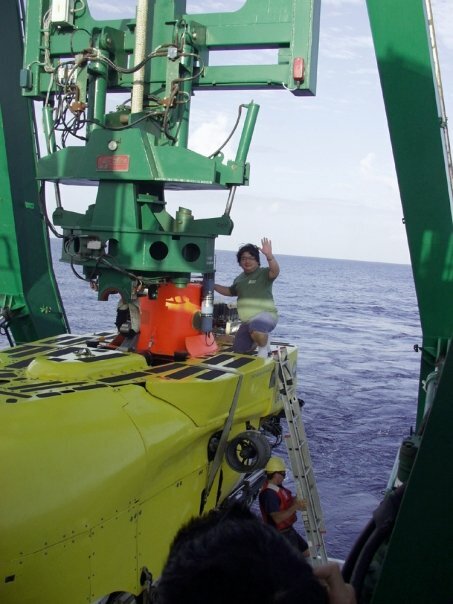 details not just his dive but ALL of the dives undertaken by the sub during the expedition to the region, including several of the world's deepest trenches, including the New Britain and the Mariana Trench (Challenger Deep). This totaled seven dives, five general dives and two into the trenches, overall ranging from 884 to 10,908 meters! Everything was captured on video and these observations are scrutinzed and analyzed! 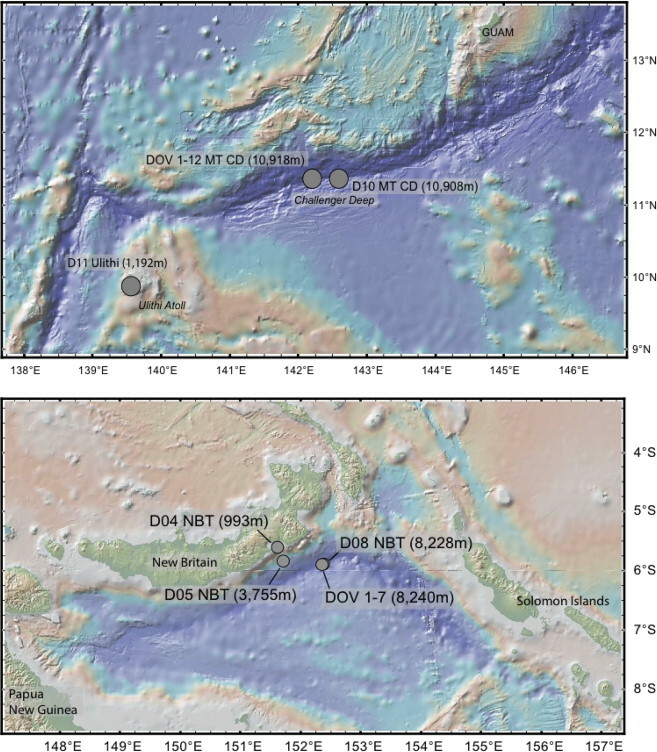 In the paper, there is what they call "allochthonous organic input" which is"science speak" for organic external or foreign materials that fall into the deep-sea which was seen more heavily near the New Britain Trench than the other regions sampled. Figure 4 from Gallo et al. In this case: plants and other related material: palm fronds, leaves, sticks, etc. but also carrion or dead animals.. Many of the animals observed interacted with the plant material.. some living on or hiding under.. In contrast, the carrion in the form of bones, etc. contributed food or nutrients to the ecosystem.. I am always keen to remind folks how important what happens at the surface impacts what happens at the deepest depths. Note here at 1000 meters food still falls FROM THE SURFACE. These were identified as caymanostellids, a weird group of deep-sea starfish which live on wood. No scale was available but known examples of these sea stars are relatively small. 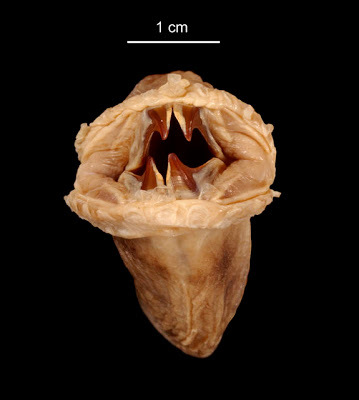 If these are truly from 8.2 kilometer depths, they might be the deepest individuals known for this group! WOO! 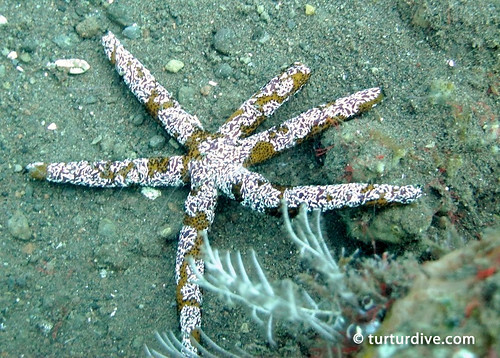 I've mentioned the deepest known records of OTHER starfish species here. Some of the deepest records are recorded from 8400 meters! So 8200 meters isn't much of a reach. 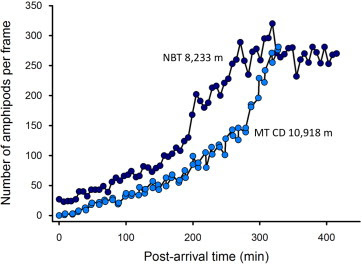 Figure 7 from Gallo et al. This is the "on the other hand" of the study areas. 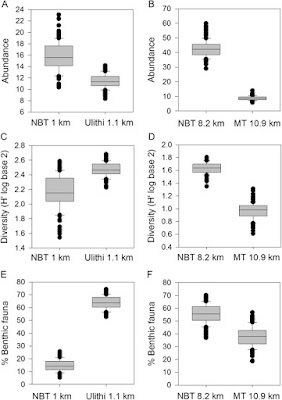 The New Britain Trench (NBT) at 1000 m was nutrient rich but the Mariana Trench at the nearby Ulithi Atoll region (1100 m) were relatively poor in nutrients. 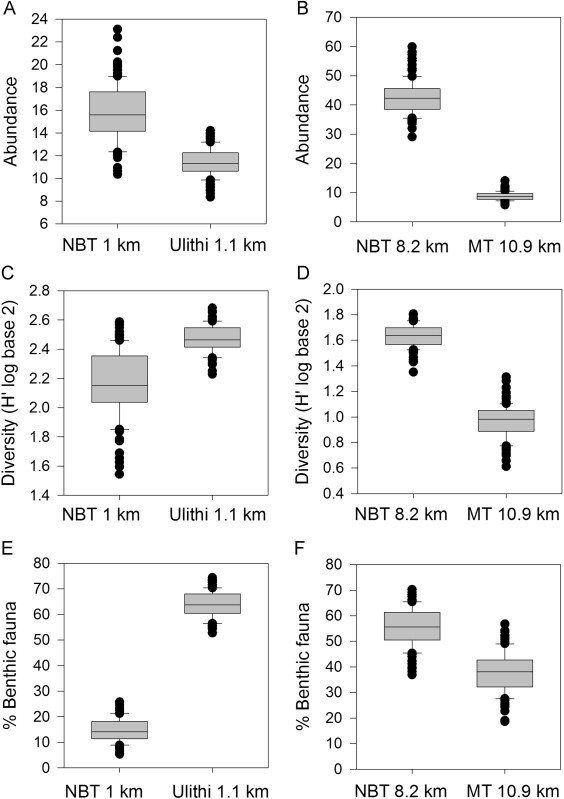 Correspondingly, the abundance AND diversity of animals observed was much less in the Mariana Trench and Ulithi Atoll regions. The New Britain Trench site also seemed to demonstrate MORE diversity than the other two studied regions. 4. There is a large and diverse bottom/scavenging community in the New Britain Trench. 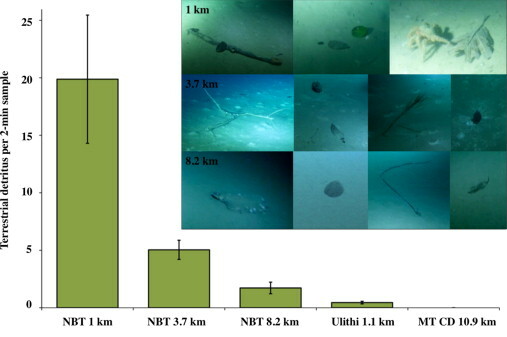 The New Britain Trench (NBT) seems to be showing a huge diversity relative to the Mariana Trench and this was further seen int terms of scavenging communities such as the amphipods. Looking at the number of amphipods in each video (per frame) they observed that there was a HUGE difference in the number observed! Those in the New Britain Trench were MUCH more abundant! One interesting thing: Absent from ALL the deep localites on this dive? NO FISH were observed. Its been argued that fish "bottom out" at about 8000 meters and are unable to occur below that.. The observations here seem to be consistent with this data. 5. Other animal observations.. Potentially new species?? Among the few animals observed at depth (from their Figure 9 below) were an odd ulmariid jellyfish (labelled C) as well many other crustaceans (D) which were either mysids or some kind of shrimp like crustacean..
One of the significant discoveries was this "squid worm", a swimming polychaete, likely in the genus Teuthidodrilus from 1 KM down in the New Britain Trench!! These were originally described from the Philippines. 5a. The Deepest Known Deuterosotome Known Probably one of the DEEPEST of the critters noted in Gallo et al's paper were, you guessed it! 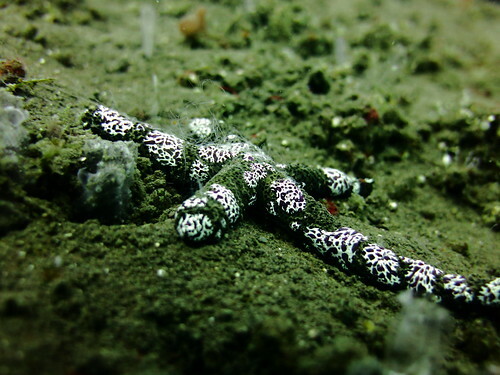 SEA CUCUMBERS. 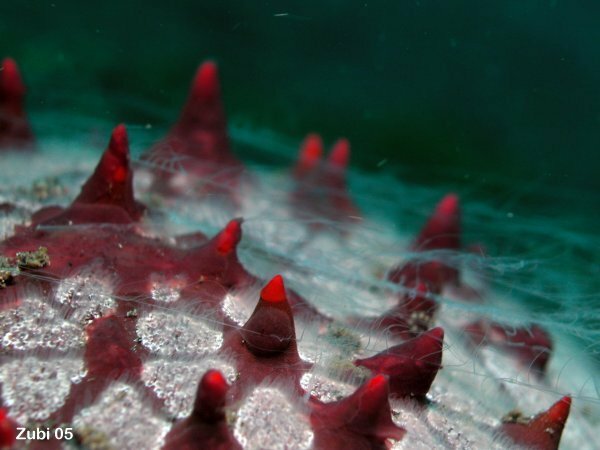 Previously, the deepest known sea cucumber was Myriotrochus brunni which was collected from 10,710 meters in the Mariana Trench. 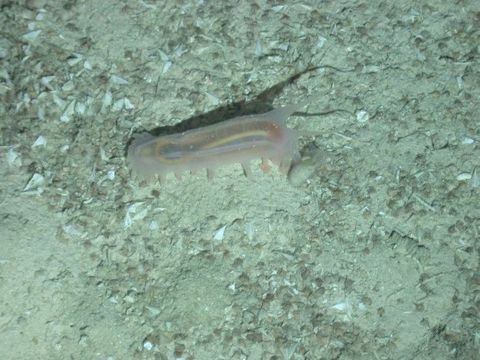 Benthic Comb Jellies!! New Observations? Last week, I had a pretty fun conversation with some colleagues, namely Anna and Ned deLoach at Blennywatcher.com, about benthic comb jellies and Its been awhile since I've had a chance to play "lets run through Flickr and see if we can discover anything new", so I thought I'd try my luck this week again !! 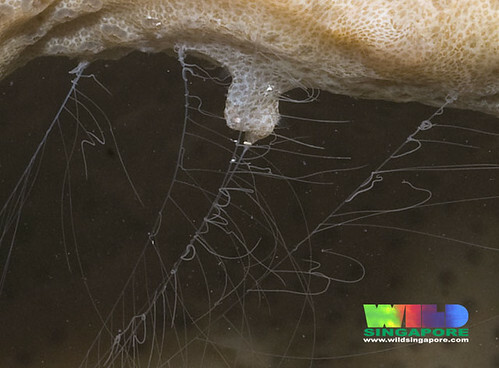 What are benthic ctenophores (aka benthic comb jellies)? I've explained them before in one of my earlier posts (here), but simply put, they are an unusual group of comb jellies, which you might be more familiar with as purely pelagic or swimming animals, such as this "sea gooseberry"
Benthic ctenophores (aka bottom-living comb jellies, benthic comb jellies, sessile comb jellies) are basically the same idea except that the animals live on bottom substrates. 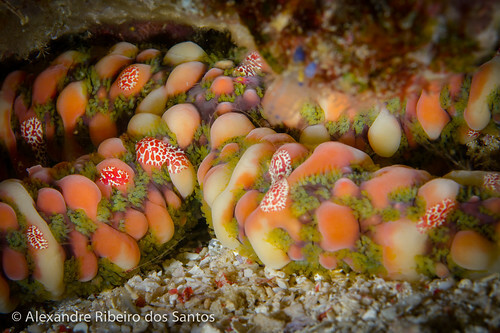 They occur in tropical habitats and in shallow to deep-water settings. 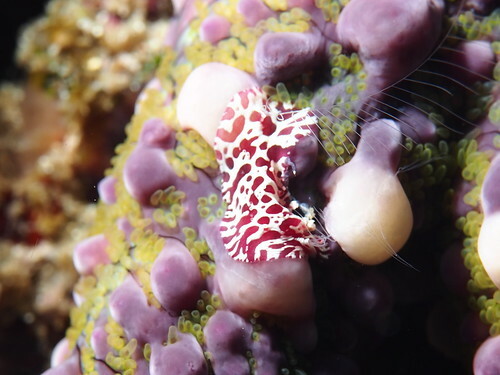 Here's a nice pic of a species which lives on coral (image by Ria Tan and my friends over at Wild Singapore). You can see the tentacles doing the same thing..but oriented "upwards" away from the bottom.. and into the current. In the last few years with the proliferation of video and underwater cameras, we've been seeing more and more of them. And so, learning more and MORE about them!! 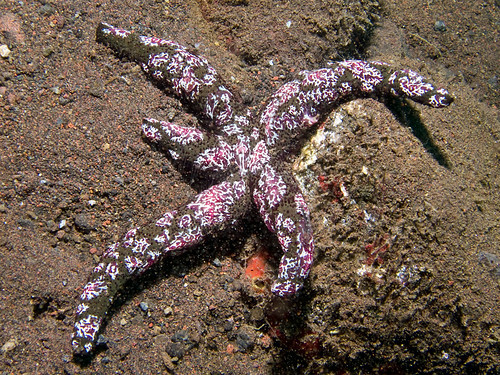 One of the main reasons, I got so interested in benthic ctenophores was that they live primarily on a starfish, Echinaster luzonicus, a 6-7 rayed species frequently encountered throughout the Indo-Pacific. 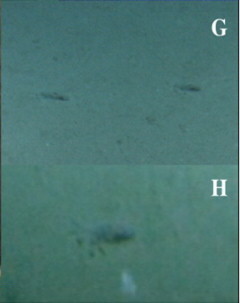 The ctenophore species is presumably Coeloplana astricola (no specimens examined, so hence my caution). As you can see in the picture above.. the feeding tentacles project up into the water to feed as they do in other species..
Other hosts? 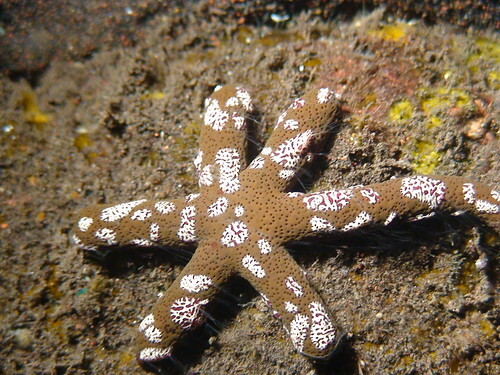 Interestingly, a review of images on Flickr reveals at least ONE other sea star that serves as a host for Coeloplana.., Another species in the SAME genus as E. luzonicus. How Far Can they GO? Another question we always ask when we see stuff like this, is just how MANY of these ctenophores can "pile on" to a host starfish?? This looks like a LOT. At least 20 to 30!! 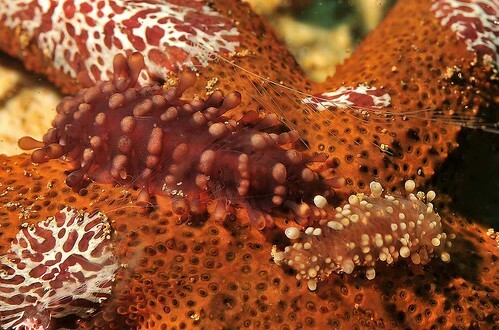 Nearly covering the surface of the starfish..
Another one mobbed by benthic ctenophores! 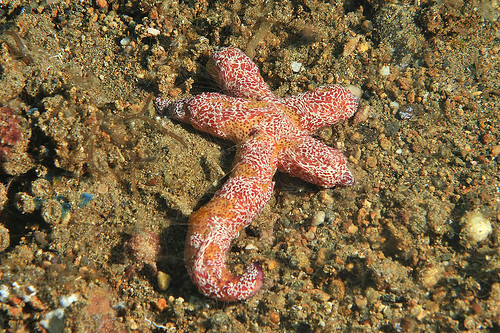 Getting away from the benthic ctenos that live on sea stars, there's also been some cool observations of some others from Flickr and Twitter.. 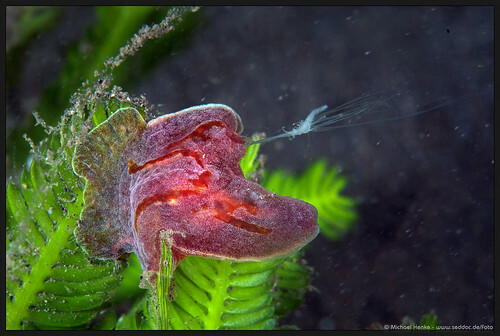 Here's an unidentified Indonesian benthic ctenophore with its feeding tentacles out.. and maybe its caught something (a shrimp)? or perhaps its just the confluence of feeding tentacles.. Some of these are just unearthly..